The Pittsburgh area is a wonderful location for a wedding. From unique outdoor locations to museums and historic sites, there are venues to suit any couple’s taste and budget. If you’re planning a Pittsburgh area wedding, consider these four points when looking for your perfect venue. One of the most important things to consider before you start your search for the perfect venue is your budget. Determine what your realistic total wedding budget is to help you decide how much you can afford to spend on the venue. When comparing potential wedding venues, be sure to find out what is included in the price and if they require that you work with specific vendors for things such as catering and rentals, as this can help you determine your true cost. If you have your heart set on a specific venue that may be a little out of your price range, see if they offer discounts for having your wedding “off season” or during one of their less busy days/times. You may find that you can have your wedding there and stick to your budget. Once you’ve established your budget, you’ll need to determine how many guests you can invite. This will help you narrow your list of possible venues to those that can comfortably accommodate your guest list. If you want to consider a venue that typically hosts smaller wedding parties, consider asking about the possibility of using outdoor spaces and / or additional rooms to see if that venue might work for you, with a little creativity. Have your heart set on a winter wedding? 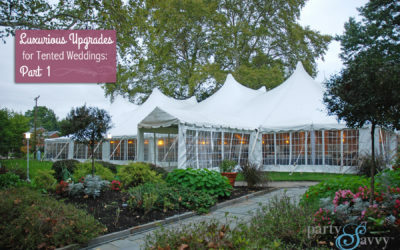 Then you’ll need to make sure the venue you choose either has enough usable indoor space for your wedding party or can accommodate heated tents adjacent to the venue, possibly for your cocktail reception, to free up more space for dinner and dancing indoors. No matter what season you choose for your wedding, you’ll need to make sure the venue can keep your guests comfortable and protected from the elements. When choosing your venue, consider the style of wedding you would like to have. Do you envision a formal wedding or something a little less traditional? We’ve assembled a fantastic list of unique wedding venues in the Pittsburgh area to appeal a variety of styles and budgets. If you love the outdoors and want to incorporate the beautiful greenery that Pittsburgh has to offer, you might consider an outdoor wedding instead of a more traditional indoor reception. Having a vision of your wedding style will help you quickly eliminate options that don’t fit and help you narrow your list when searching for the perfect venue for your wedding. If you need more help choosing a Pittsburgh wedding venue, browse our photo gallery for real Pittsburgh-area weddings at any number of venues that might appeal to you, and be sure to contact us for all of your wedding rental needs.